When the Iowa Hawkeyes played in last year’s Insight Bowl, it marked their first postseason visit to Greater Phoenix since the university formed a varsity football team in 1899. They didn’t wait nearly that long to make a return trip. Iowa will square off against perennial Big 12 powerhouse Oklahoma in the 2011 Insight Bowl on Dec. 30 at Sun Devil Stadium in Tempe. The Hawkeyes will be going for a school-record fourth consecutive bowl victory on the same field where they vanquished Missouri 27-24 a year ago. 9. Ring in the New Year on Mill Avenue. 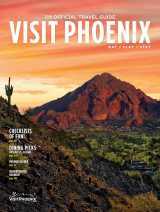 For a taste of the Old West, check out the cowboy and Native American art galleries of Old Town Scottsdale, see Cave Creek or South Mountain from the saddle of a trail horse, take a scenic drive along the Apache Trail to the outpost of Tortilla Flat (population 6), or mosey down to Rawhide Western Town and Steak House. The latter, a spot-on replica of an Old West main street, features gunfights, stunt shows, stagecoach rides and live country music. 7. Relish a resort experience. Greater Phoenix has more luxury resorts than James Vandenberg has touchdown passes, and staying at one these elegant retreats is a vacation in itself. Expect gorgeous grounds, kingly service, fine food, and access to some of the best golf courses and spas in the Southwest. From fashionable malls to chic boutiques to charming antique shops, Greater Phoenix harbors a spectrum of retail experiences few destinations in North America can match. Take advantage of the pleasant weather to stroll the garden-park setting at Biltmore Fashion Park, the outdoor promenade at Keirland Commons or the sidewalk shops of Old Town Scottsdale. Peruse high-fashion couture at the palatial Scottsdale Fashion Center, or search for vintage goods in midtown Phoenix’s funky Melrose District. Greater Phoenix is one of only a half-dozen U.S. cities with eight professional sports franchises, and one of the locals’ favorites is the Phoenix Suns. Led by two-time league MVP Steve Nash, the Suns play their home games at US Airways Center in downtown Phoenix. The Suns host the Philadelphia 76ers on Dec. 28 and the Golden State Warriors on Jan 2. The Phoenix Coyotes, meanwhile, host the reigning Stanley Cup champion Boston Bruins on Dec. 28. 2. Play 18 … or 36 … or 54. The Scottish invented golf, but Phoenicians might have perfected it. Greater Phoenix is home to more than 200 golf courses, many designed by legends of the game such as Jack Nicklaus, Tom Weiskopf and Pete Dye. This is desert golf at its best, with emerald-green fairways set against a panorama of rugged mountains and towering cactuses. Some courses occupy canyons where civilization feels a world away, while others are part of opulent resorts where you can relish a “warm golf ball massage” after your round. For more details about the above attractions, plus information about where to stay and dine in Greater Phoenix how to get around town, Insight Bowl fans can log on to www.visitphoenix.com/insightbowl2011.